mBit Casino, one of the best bitcoin online casinos in the world, runs several lucrative promotions. Throughout the month of December, bitcoin players have been making a few extra bitcoins by taking part in the slot tournaments at mBit Casino. These slot tournaments are believed to be the biggest to be held at any bitcoin online gambling site. Now players can take part in another lucrative promotion called Cashback Thursday, which is held every Thursday at the bitcoin online casino. Visit mBit Casino and claim your cashback here. 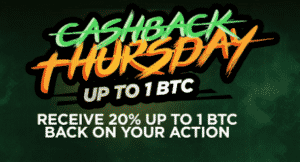 The Cashback Thursday promotion gives players the chance to get Bitcoin cashback of 20%. To qualify for this cashback, they only have to play their favorite bitcoin online casino games at mBit Casino. The cashback will be credited to players’ accounts as soon as they login to their accounts on Fridays after taking part in this promotion on Thursdays. Needless to say, players have to first create a new account at mBit Casino in order to take part in lucrative promotions such as slots tournaments, Cashback Thursday, and others. In the meantime, here are a few more details on the famous Cashback Thursday promotion at mBit Casino. If players make a deposit and play for bitcoins, but fail to win any prizes on Thursdays, they will receive cashback of 20% on their losses up to 1BTC. This promotion will be run from 12:01 a.m. UTC to 11:59 p.m. UTC on Thursdays. To get cashback on your Thursday losses, you simply have to deposit in bitcoins and play your favorite bitcoin online casino games on Thursday. On Friday, the casino will credit 20% of all the bets you lost on Thursday, up to a breathtakingly large sum of 1BTC. Players should, however, note that they cannot withdraw their cashback right away because there is a wagering requirement of x5 on it. This means that players have to rollover their cashback amount five times before they can be allowed to request cashback. mBit Casino also pampers players with a match bonus of 50% on Thursdays. This means that players can not only take part in the Bitcoin cashback promotion, but also grab a match bonus of 50% on their deposit amount. To claim their bonus, they have to input the bonus code BIGCASH. Bitcoin players have plenty of reasons to sign up at mBit Casino. The bitcoin online casino not only welcomes new players with 100 free spins plus a match bonus of 110% up to 1BTC on their first deposit amounts, but also offers a rich portfolio of over 900 bitcoin games. In addition, new games are introduced on a regular basis, and players are challenged to win their share of jackpots worth more than 6000BTC. The portfolio includes games from noted providers such as Pocketdice, Amatic, Betsoft, Endorphina, Ezugi, iSoftBet, GameArt, Habanero, MrSlotty, Quickfire, NetEnt, and SoftSwiss. All the games are provably fair, and the catalog includes some branded titles such as Nacho Libre, Basic Instinct, Platoon, Motorhead, and The Invisible Man.